I learned some basic electronics in high school physics class: resistors, capacitors, Kirchhoff’s law and such, and added only what was required for projects as I did them. Then around 15 years ago I decided to read some books to flesh out what I knew and add to my body of knowledge. It turned out to be hard to find good ones. The electronics section of my bookcase has a number of what I’d consider duds, but also some gems. Here are the gems. They may not be the electronics-Rosetta-Stone for every hacker, but they are the rock on which I built my church and well worth a spot in your own reading list. Grob’s Basic Electronics by Mitchel E Schultz and Bernard Grob is a textbook, one that is easy to read yet very thorough. I bought mine from a used books store. The 1st Edition was published in 1959 and it’s currently on the 12th edition, published in 2015. Clearly this one has staying power. I’d recommend it to a high school student or any adult who’s serious about knowing electronics well. I’d also recommend it to anyone who wants to reduce frustration when designing or debugging circuits. You can find the table of contents here but briefly it has all the necessary introductory material on Ohm’s and Kirchhoff’s laws, parallel and series circuits, and so on but to give you an idea of how deep it goes it also has chapters on network theorems and complex numbers for AC circuits. Interestingly my 1977 4th edition has a chapter on vacuum tubes that’s gone in the current version and in its place is a plethora of new ones devoted to diodes, BJTs, FETs, thyristors and op-amps. You can also do the practice problems and self-examination, just to make sure you understood it correctly. (I sometimes do them!) But also, being a textbook, the newest edition is expensive. However, a search for older but still recent editions on Amazon turns up some affordable used copies. Most of basic electronics hasn’t changed and my ancient edition is one of my more frequent go-to books. But it’s not the only gem I’ve found. Below are a few more. [Ben] just sent us this great reference sheet. 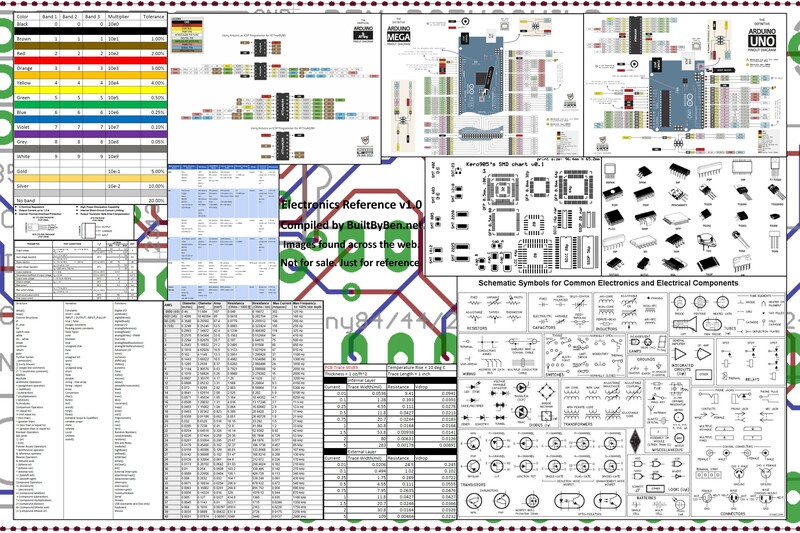 It’s a poster he compiled of datasheets and various electronic references. He made it after spending too much of his time sifting through datasheets while working on projects. It also helped that he realized his school, Georgia Tech, had a poster printing service! It contains the basics from resistor color codes, typical pinouts of various chips, current capacity of wire gauges, Arduino pinout diagrams, schematic symbols, trace widths for current capacity, and even typical coding functions! The full image is 9,000 x 6,000 pixels and will print nicely at 30 by 20 inches, just shy of the ANSI D paper size. It’s 6.1MB so only click here if you want it! Maybe if we ask nicely he’ll share the original MS Publisher file so we can tailor it to our individual needs! Some of the text in the images is a bit blurry, but everything is basically still readable.